This week NASA’s Jet Propulsion Laboratory released a report on the sources of our Four Corners methane hotspot. The study confirmed that the energy industry, specifically natural gas extraction, is as a primary cause. Methane makes a large contribution to climate change because methane is 86x more impactful as a greenhouse gas than carbon dioxide. Methane waste results in lost royalties, which reduces funds for school, health care, and infrastructure in our communities. Venting, leaking, and flaring methane and associated co-pollutants threatens the health and well-being of our citizens. Learn more about methane on our Methane Hotspot page. The NASA study named two-dozen methane “super-emitters” in the area. Yesterday we field-tripped with colleagues from EARTHWORKS and the Sierra Club to check out some of them. 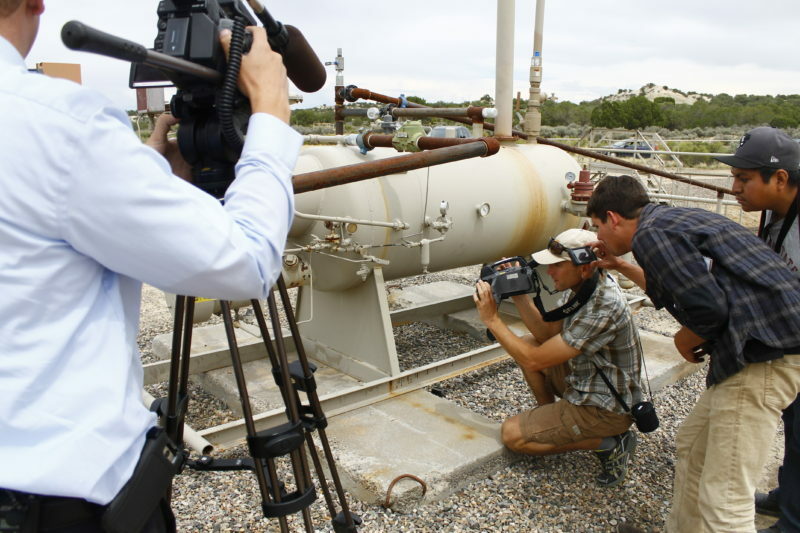 We used a trusty FLIR camera to find methane emissions (leaks and intentional), which are usually invisible. We found 4 leaks on one site! Check out the videos below to see the FLIR footage in action. Identifying these super-emitters is helpful in starting to manage our methane hotspot problem, now that we know who the big culprits are we can start holding those responsible accountable for cleanup. But a much higher percentage of the hotspot is fueled by smaller, unidentified sources all over the Four Corners – these are the sources that necessitate strong Bureau of Land Management and Environmental Protection Agency rules and regulations for methane. Without the rules we cannot eliminate the hotspot. Tell the Obama Administration to get the BLM methane rule across the finish line ASAP.